Gone are the days when I could plan dinner half an hour before eating it, standing in front of the fridge with a glass of wine. These days, thinking about dinner in some form takes up most of the day. Sometimes it even starts the night before. You might be blessed with that mythological being – the Good Eater – in your house, and thank your lucky stars if you are. But I’m not – and with three children, the probability of dinner time being fun gets much lower with every extra kid you add into the mix. 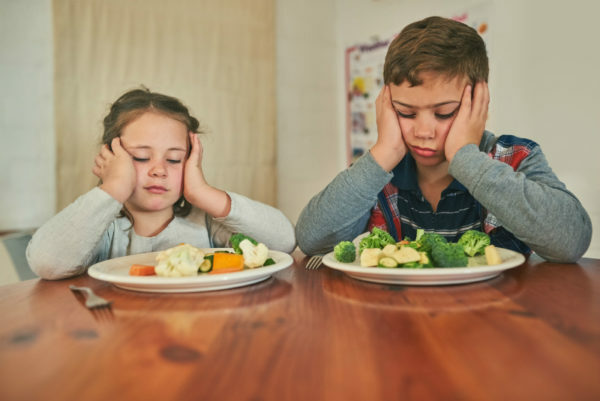 Here are seven stages parents of fussy eaters go through in the lead up to dinner each night. It’s no coincidence that there are also seven stages of grief – and seven circles of hell. Welcome, new day! I’m not as thrilled to be up as if it were, say, 11am, but I’m coping okay and feeling good about the day ahead. As the Good Book says, “weeping may endure for the night, but joy comes with the morning” – and that’s because all children like eating breakfast. After all, they’re pretty hungry, having only eaten around the edges of last night’s dinner. In the morning, I’m unrealistically hopeful about the meals ahead. It’s a brand new day, and I’m not (too) tired yet. This is when I start making outlandish plans for what the kids will eat tonight, even if they’ve never happily touched it before. I’ve decided to put last night behind me. It wasn’t great. I needed a glass of wine afterwards, but actually, how hard can it be to get the kids to eat something nutritious without complaining? It’s not rocket science, right? French women can do it, according to that book I once saw in a bookshop somewhere that made me feel bad about myself. I’m as good as the French! Turns out all those healthy things I might need for my great new meal were going a bit rank in the bottom of the fridge. Just need to duck quickly into the supermarket with two kids under three. Should be fine. I’ll be SUPER quick. I only need six items and they are all in the fresh food section. I’ve got this. Tip for new players – there is no such thing as “ducking quickly into the supermarket”. What was I thinking? Mum delusion has definitely set in. Now for TV time – everyone needs to recover after that trip out. Seriously, I am so tired. Why do they need to have dinner EVERY. SINGLE. NIGHT? This meal I was planning actually has a million steps to it. Oh, I have to feed the baby again. Wake up from micro-sleep I just had in front of Octonauts. Oh wow, it’s already 5pm. Was going to get Miss Three to help with dinner prep so she might actually eat it, but now everyone is losing it. Maybe I can just find another episode of Ben and Holly. Yes, that will have to do. I picked a really tasty meal – I am sure they’ll still eat it. I’m a little nervous now that I see how nutritional dinner looks. But best to press on. I firmly demand that everyone eats everything on their plates. After all, I haven’t put too much on there. If they eat it all they will get a sticker for the sticker chart that I will TOTALLY get around to making tomorrow. Spoiler alert: we settled on five big forkfuls. Everyone cried. The kids are in bed. But I expect to be seeing them for a while yet, with requests for drinks of water and a banana, because THEY’RE SO HUNGRY. Spend some time wondering how long kids could survive on plain ravioli (with nothing on it) before developing scurvy. I wonder how old kids need to be before they can cook their own meals? Seriously, I should google that.